There is at least 400 carp present in the water and it is estimated that 40% of these are in excess of twenty pounds in weight, with a number of these exceeding 30lbs up to nearly 40lb. The water also holds small numbers of large perch, tench, pike and few big bream. This lovely lake of over nine acres is situated just a few minutes drive away from the main complex. It is stocked with over 400 carp, and at least 40% of these are estimated at over twenty pounds in weight. There are a number of different thirties present in the water to nearly 40lb. Linear continue to keep the water well stocked. A number of carp were stocked in 2016 and there will be more introduced in the neat future. Hunts Corner Lake is a secluded, long rectangular shaped gravel pit that is well matured. 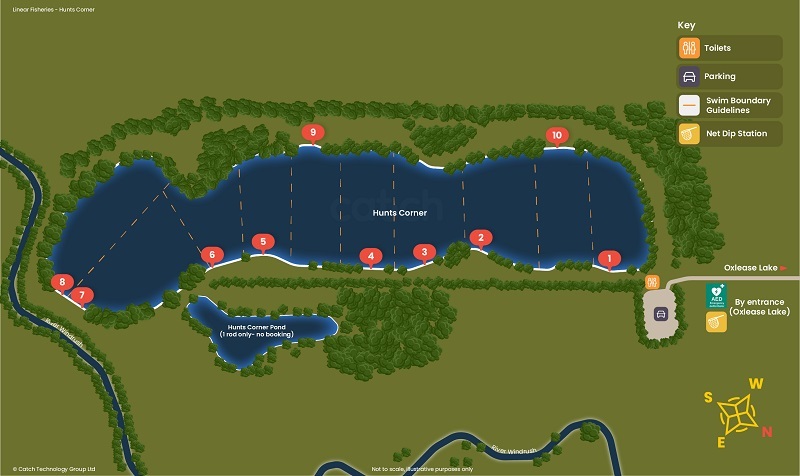 There are only ten swims that have been situated in a way to give the angler more seclusion and nearly an acre of water to fish. Because of this prices are slightly higher than our other ticket waters and in line with our other waters places are available on a first come first served basis - we do not take bookings for individual swims but can take bookings for the whole lake. Access to Hunts is through the main Oxlease gate which is locked at night. Please remember that the Oxlease gate will be locked for security reasons at night. If you arrive after it is locked you must park in the early arrival car park by Hardwick Lake until we open at 8am. You must not block the gate or park alongside the track leading past Newlands Angling Club - if you do so you may be asked to leave the fishery. PLEASE TAKE CARE IF CROSSING THE B4449 ROAD FROM THE HARDWICK CAR PARK. Access to Hunts is through the main Oxlease gate which is locked at night. As with Oxlease anyone arriving during lock up times must wait on the Hardwick/Brasenose track at the main site until the gates are unlocked by 8am.